In the United States we are not exposed to much revelry for our ancestors. As I delve deeper into my own psyche for my training as a future therapist I find it increasingly important to honor my family history. 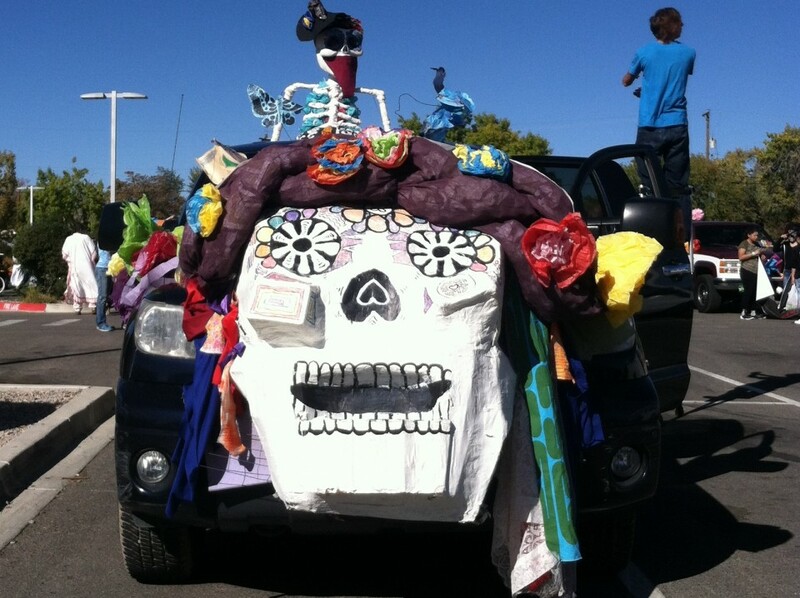 This seemed perfectly relevant to me when I was invited by a friend to join her at the Dia de los Muertos parade in Albuquerque (1 hour south of Santa Fe). This invitation expanded into a series of invitations as another mutual friend invited us to join him in the parade. He had been invited to join his friends, the Hearth Fire Pagans, to participate in their float presentation at the parade. What an honor to be invited to participate. 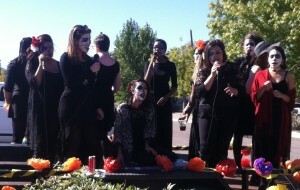 I strained to be able to pronounce “Dia de los Muertos” (I studied 2 years of both Chinese and Japanese but Spanish is.. phew!). I did a little bit of research on the festivity, wanting to be as informed and respectful at possible. 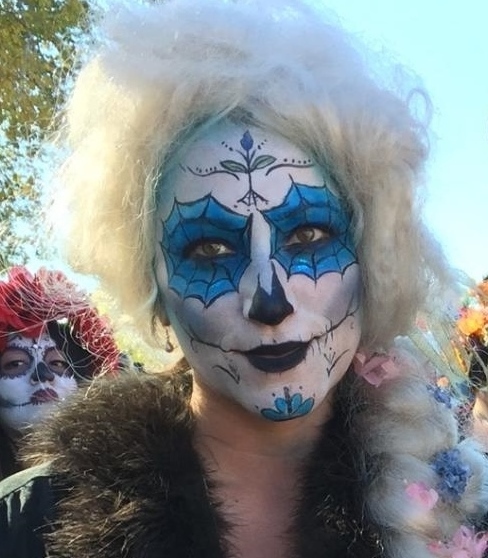 I discovered that Dia de los Muertos (also called Dia de Muertos) is not a time for grieving but a time to celebrate the lives of those who have influenced us and have passed on. There are many nuanced aspects to the Day’s history. It has only been a Mexican national holiday since the 1960s but it has been practiced in varied forms in Central America for thousands of years and coincides with many other Earth-based spiritual traditions which honor the deceased at approximately this time of year. In this spirit, I decided to focus on by own dearly departed. The previous evening I dreamt of my grandfather who passed away last year, and of my most beloved canine companion from when I was a child. Upon awaking I dressed for the event and included jewelry which had belonged to deceased elders in my life. I could feel a connection to the wisdom, guidance, and influence which I had received from these people. The day was beautiful and powerful. The Hearth Fire Pagans gathered in a member’s yard. There was food, music, gaiety, and a few professional artists applying make-up to faces. I let (my) make-up artist have her way with my face and the result was spectacular! We left for the parade staging area where I had the honor of getting close and personal with many other parade participants. I took the most photos here since I was busy running, dancing, and giving candy to children while the parade was taking place. After the parade I went with my friends, new and (relatively) old, to the celebrations at the local community center. 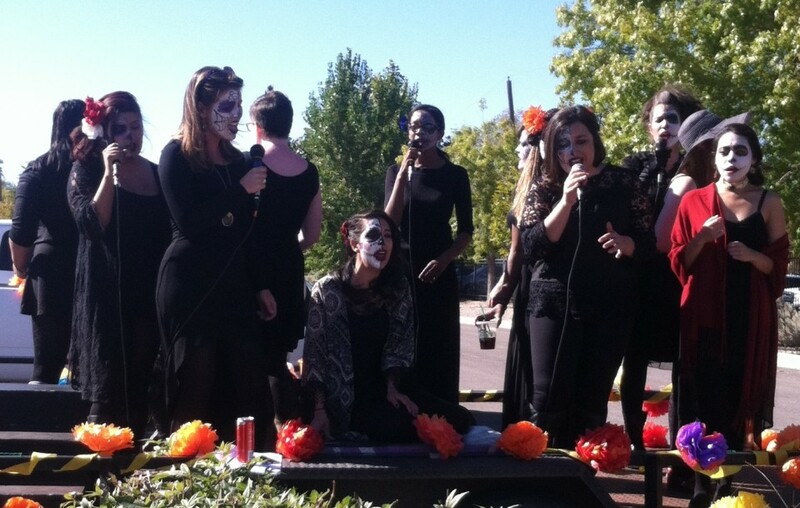 Outside there were art vendors, food trucks, and a stage featuring live music and poetry. A large room at the community center contained altares of ofrendas, altars containing many offerings to the departed. 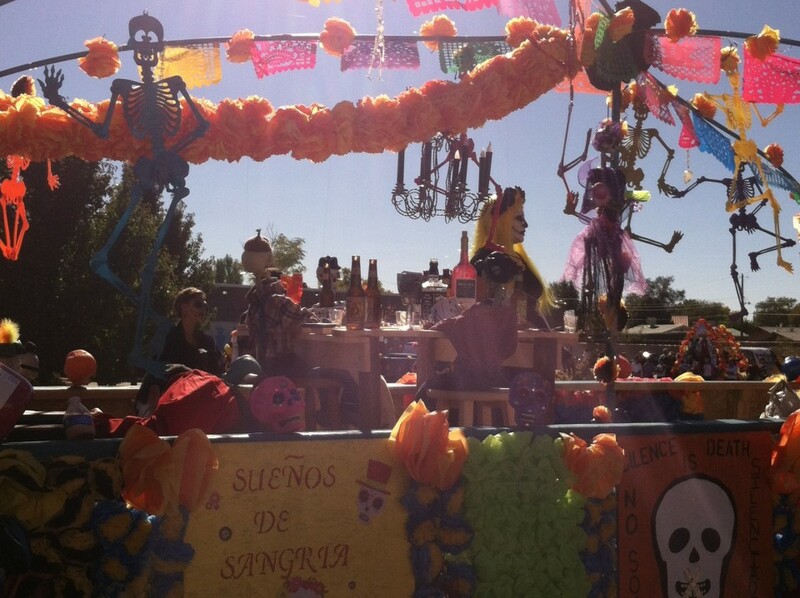 These ofrendas featured bread loaves, sugar skulls, photos, and favorite belongings of those who have passed. A space was offered for event attendees to honor their own departed loved ones and I added some names to a list on this ofrenda. After leaving the festivities at the community center we headed back to Santa Fe. I was exhausted and exhilarated by the Day’s events. It was truly an honor to be a guest on so many levels at this celebration.